1859. The Buckinghamshire Battalion of the Oxfordshire and Buckinghamshire Light Infantry traces it history back to 1859 and the threat of invasion by the French. The British Army was still heavily involved abroad after the Indian Mutiny and there were very few regular army units left at home. As a result the “Rifle Volunteers” (the Home Guard of its day) was formed to repel the possible invasion. 1862. These units consolidated to become THE 1ST BUCKS ADMINISTRATIVE BATTALION. 1875. Changing its title once again on consolidation to 1st BUCKS RIFLE VOLUNTEERSthe title that it was to keep until the formation of the Territorial Force in 1908. 1881. The 1st BUCKS RIFLE VOLUNTEERS became a Volunteer Battalion of the OXFORDSHIRE LIGHT INFANTRY in 1881. They retained their own title instead of becoming the 3rd Volunteer Battalion and resisted all official attempts to trade their distinctive dark grey riflemen’s uniform for the scarlet of the regulars. They also kept their own regimental march “Ninety Five”. 1900-1901. During the Boer War (1899-1902) the 1st Bucks Rifle Volunteers raised a sixty-man composite Company that was attached to the 1st Battalion Oxfordshire Light Infantry (43rd) and served in South Africa departing Aylesbury on 10th March 1900. The Active Service Company returned home in May 1901. 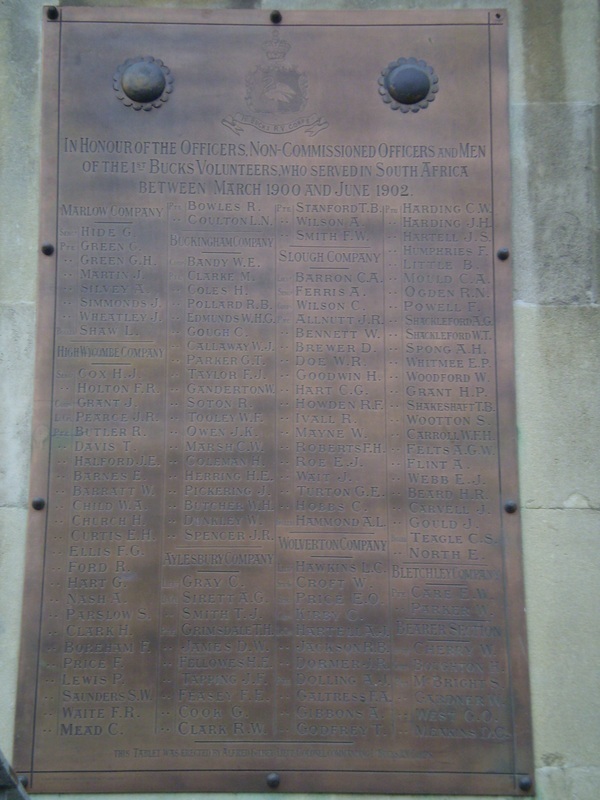 A plaque can be found in Aylesbury market square bearing the names of those from the 1st Bucks Rifle Volunteers who served in South Africa. 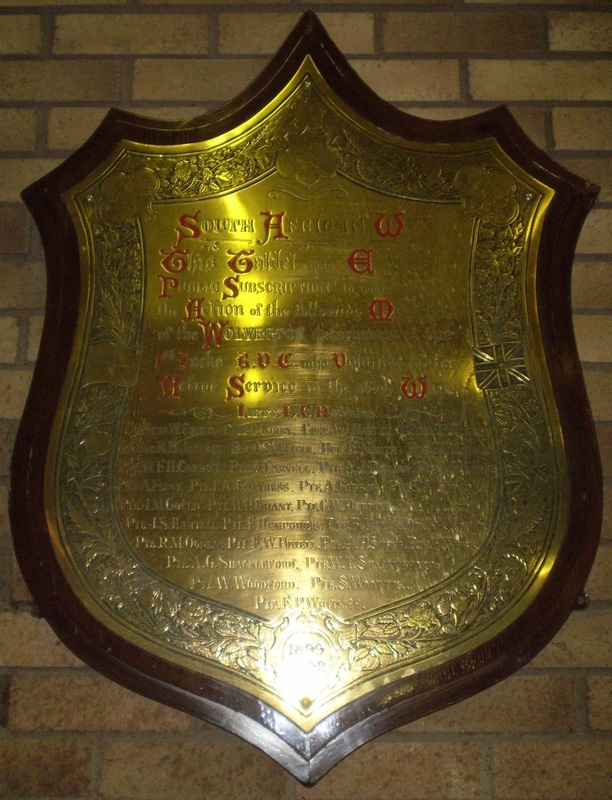 Donations were made by the public to commemorate the 34 men of the No6 Wolverton Company who served in South Africa and from the sum collected a tablet was made in the Wolverton Carriage Works that was to hang in the Wolverton Science and Art Institute until its closure when it returned to the Works and hung in the Foreman’s Room. 1901. On theintroduction of khaki in 1901 the dark grey riflemen’s uniform became “Full Dress” with first the spiked helmet, replaced later by the riflemen’s busby. Khaki service dress was worn with a slouch hat. 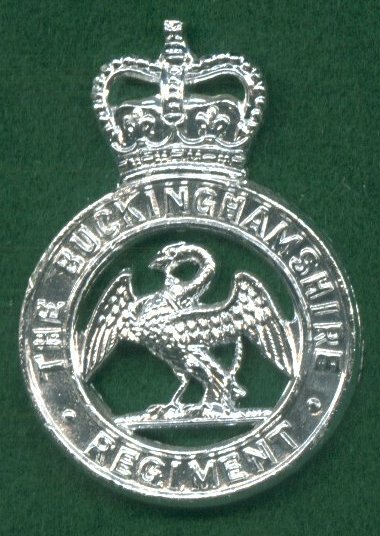 The cap badge being the Buckinghamshire swan in a circle bearing the title “1ST BUCKS RIFLE VOLUNTEER CORPS” all surmounted by a kings Crown. Pouch belts had the badge of a crowned laurel wreath in which were the letters BVRC. 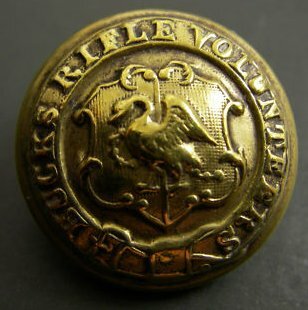 All ranks wore black buttons bearing the Bucks swan on a shield surrounded by a belt bearing the title “BUCKS RIFLE VOLUNTEERS”. 1908 saw the disbandment of the 3rd (Militia) Battalion of the Oxfordshire Light Infantry (ROYAL BUCKS KINGS OWN MILITIA (RBKOM)) and also the threat of the 1st Bucks Rifle Volunteers becoming the 5th Battalion of the Oxfordshire Light Infantry on the introduction of the Territorial Force. 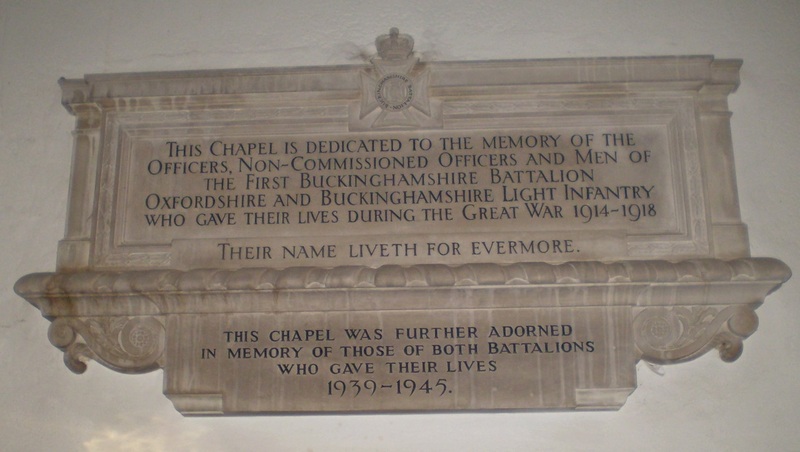 As a result of much public pressure in Buckinghamshire, not only did Buckinghamshire’s territorial infantry become: -“THE BUCKINGHAMSHIRE BATTALION” but the regular regiment changed it title to THE OXFORDSHIRE AND BUCKINGHAMSHIRE LIGHT INFANTRY. The Bucks Battalion found its self in the new“South Midland Division”. 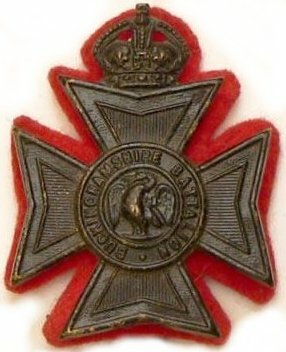 The cap badge of the new unit consisted of the Buckinghamshire swan surrounded by the title “BUCKINGHAMSHIRE BATTALION” on a Maltese cross surmounted by a Kings Crown. 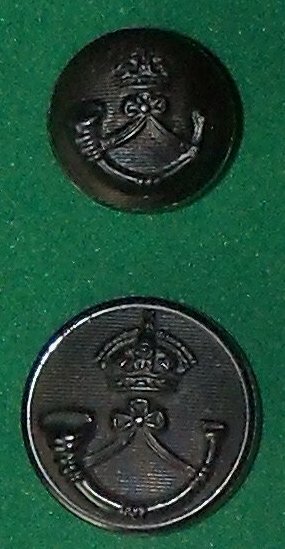 All ranks wore black bugle horn buttons, officers wearing black bugle horn “ball” buttons. 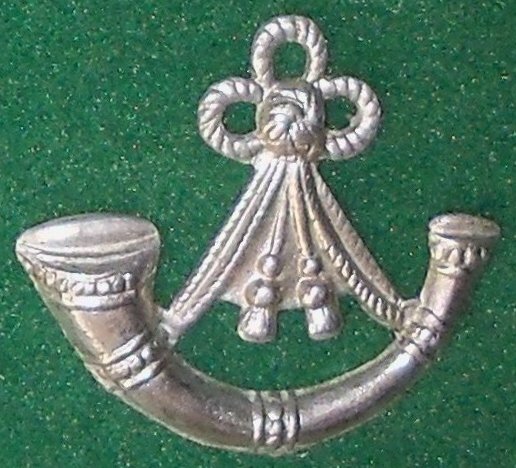 A similar design as the cap badge but larger and in Silver was worn on the Pouch Belt. 1914. On the outbreak of the First World War on 4th August 1914 the Battalion was at annual camp at Marlow when it was recalled to Aylesbury and mobilised for war. It first entrained for its war station at Cosham, Portsmouth, before again entraining for Swindon where it carried out a week’s training. They then moved by foot to Chelmsford where the Battalion trained until embarking for France. In September the Buckinghamshire Battalion split to form a first line unit 1/1st Buckinghamshire Battalion and a Second Line unit 2/1st Buckinghamshire Battalion. Later in November a third line draft producing unit was formed, 3/1st Bucks. 1915. The 48th (South Midland) Division containing the 1/1st BUCKINGHAMSHIRE BATTALION, part of 145th Infantry Brigade proceeded to France on the 30th March 1915 landing at Boulogne. After three months in the line near Ploegsteert (known to the Tommy as Plugstreet) the battalion moved in July to the Heburtene Sector on the Somme where it spent a year. 1916. During the 1916 Battle of the Somme the Battalion was in action for two periods, each of about three weeks, during which its most notable achievements were a very successful attack between Ovillers and the village fortress of Pozieres, and the capture and holding of the Skyline Trench immediately north west of Pozieres. 1917. In January 1917, after a spell in the trenches at Le Sars, the Battalion took over the line at Biaches, south of the Somme, and from there took part in the advance through Peronne towards the Hindenburg Line. On the night of 16th/17th April the battalion carried out a brilliant night attack in pouring rain on the German strongpoint of Tombois Farm. In August the Battalion took part in the Third Battle of Ypres making a very costly but successful attack near Langemarck, on the 16th, and after two more periods in the line, moved to Vimy Ridge. In November 1917 the Division moved to Italy. Plateau where it helped to beat off the great Austrian attack of June 15th. On November 1st 1918 it took part in the attack north of Asiago, capturing Mont Catz and penetrating to a depth of about four miles. On the day of the Armistice the Battalion was fifteen miles inside Austrian territory after which it returned to Italy. The Battalion had added to its battle honours: - PIAVE, VITTORIO VENETO and ITALY 1917-18 For their services in Italy the Battalion was awarded a diploma and facsimile in bronze of a gold medal presented by the King of Italy. 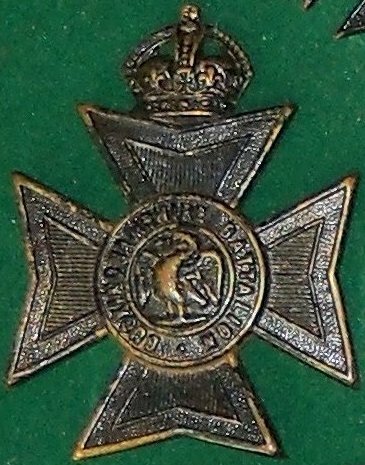 Of all the infantry battalions on the Italian front only three were selected to receive this honour. The Battalion returned home as a cadre in March 1919. 1914. 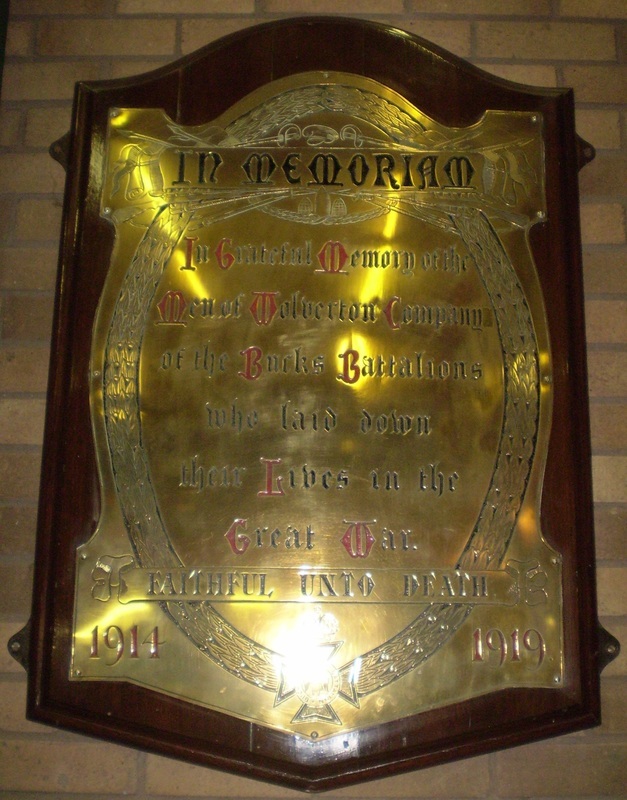 The 2/1st BUCKINGHAMSHIRE BATTALION was recognised as a separate unit on 26th September 1914, remaining in the United Kingdom for training and garrison duties. 1917. Duringthe German retirement to the Hindenburg Line the Battalion distinguished itself before St Quentin, and later, after holding the line near Arras, moved north for the Third Battle of Ypres. On 22nd August in the attack on Somme Farm, Aisne Farm and Kansas Cross Roads, it again distinguished itself. Moving in November to the Cambrai area, the Battalion held the line in front of Villers Plouich during the German counter attack. 1918. In February 1918 on the reduction of Infantry Brigades from four to three battalions the 2nd Bucks Battalion was withdrawn to be disbanded. 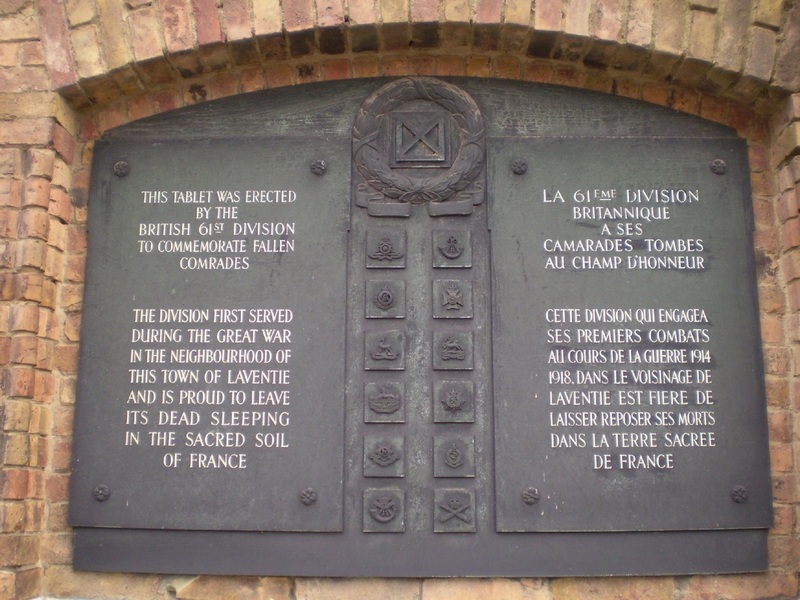 In March as the 25th Entrenching Battalion it was heavily engaged in the fighting during the German Spring offensive from 21st March until on 7th April when it was finally amalgamated with the 2/4th (TF) Battalion, Oxfordshire and Buckinghamshire Light Infantry. 1920 with the re-formation of the Territorial Army the Buckinghamshire Battalion was reformed. Between the wars a red cloth backing was added to the cap badge and badges of rank of KRRC type black on red were worn along with black “rifleman”belts. 1939. In June 1939 with the threat of war looming the Buckinghamshire Battalion was once again split this time into 1st and 2nd Bucks Battalions. The 1st Bucks Battalion being formed from the companies at Aylesbury, Amersham and Wolverton and the 2nd Bucks Battalion being formed from those at Marlow, Slough and High Wycombe. The Territorial Army was embodied on the 1st September 1939. 1940 The 1st Bucks Battalion still serving with 145 Infantry Brigade of the 48th Division Proceeded to France with the British Expeditionary Force (BEF) landing at Le Havre on the 18th January 1940.
other two divisions of I Corps (5th & 50th) who were detached for the defence of Vimy Ridge and Arras. On the 24th May 145 Brigade were given the task of holding the town of Cassel, but on the way to Cassel the Brigade was also given the task of defending the important road and railway junction town of HAZEBROUCK. As the Bucks were the rearguard unit it was easier to detach them and they were given the task. HAZEBROUCK lay in the South West corner of the semi circle forming around DUNKIRK and was to be where the 1stBucks Battalion would make its last stand over two days of fighting against the German 8th Panzer Division. 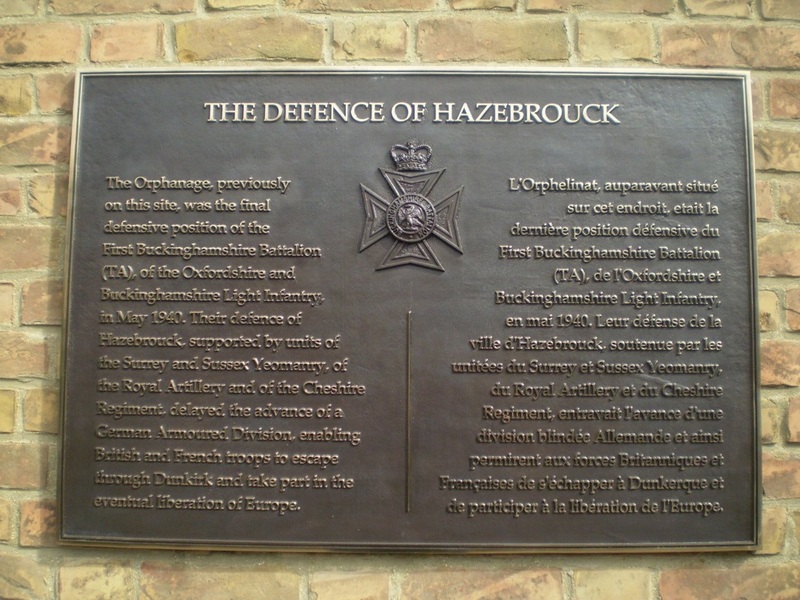 Of those who fought at Hazebrouck only 10 officers and 200 men succeeded in getting back to England. The Battalion reformed at Hereford and trained mainly in the South West of England. 1942 In December 1942 the Battalion finally left 48th Division and was transferred to 54th Division in Suffolk where it took up defensive positions along the coast. 1943 the battalion was selected to form the nucleus of a “Beach Group”, this new formation was designed to land vehicles and stores across open beaches in the early stages of a seaborne landing. In April 1943 the battalion moved to Scotland for training in this new role. The Battalion eventually became part of 101 Beach Sub Area of No 6 Beach Group part of 3rd Infantry Division. 1944 The Battalion landed in Normandy on D-Day, June 6th 1944. After fulfilling their Beach Group roles on SWORD Beach the Group was officially dissolved and on 30th July the 1st Bucks Battalion was put under the command of the 1st Canadian Army and 6th Airborne Division for operations serving alongside the 2nd battalion Oxfordshire and Buckinghamshire Light Infantry. In August the battalion was broken up to provide reinforcments with many of the battalion’s officers and men being posted to the 51st (Highland) Division. Later on the battalion was again made up to strength and served in Brussels as line of communication troops. 1945 In February 1945 the Battalion was designated a “T” or Target Force Battalion designed to seize and hold targets of special importance such as radio transmitters, factories or secret weapons sites, this role the battalion carried out until the end of hostilities. After VE day the Battalion was stationed at Menden, Germany. 1946 In June 1946 The 1st Bucks Battalion was placed into “suspended animation” and finally disbanded on 7th August 1946. Although retaining the Bucks Battalion Cap Badge and Black Buttons. On the disbandment of 431 LAA Regiment the “Bucks Battalion traditions” were handed onto the 4th Battalion, OXFORDSHIRE & BUCKINGHAMSHIRE LIGHT INFANTRY (TA) which had raised D company at High Wycombe in 1950, recruiting was later extended to Newport Pagnell and Slough. THE BUCKINGHAMSHIRE REGIMENT RA (TA). 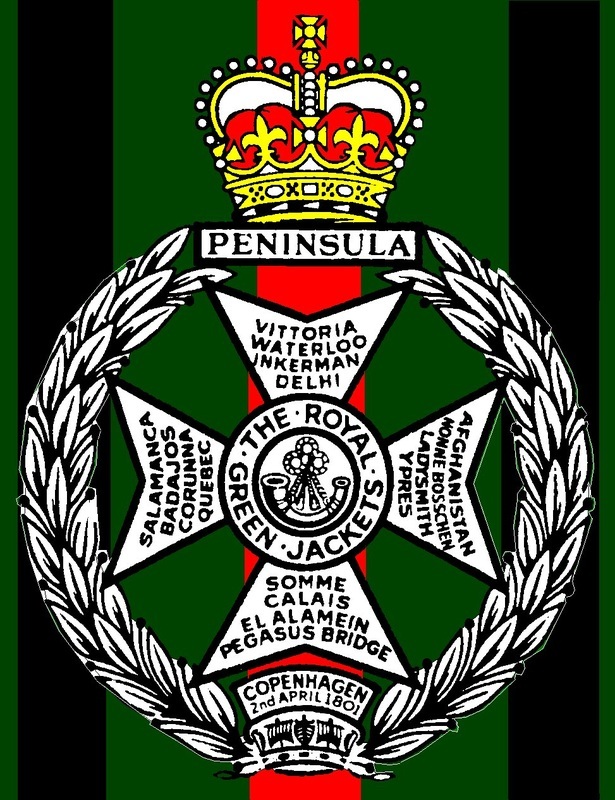 4th (Volunteer) Battalion, The Royal Green Jackets. was formed recruiting from Oxfordshire and Buckinghamshire. 1998. With the Strategic Defence Review of 1998 the 5th (V) Battalion, The Royal Green Jackets was disbanded with A (RGJ) and E (RGJ) companies forming part of a new “Home Counties Infantry Battalion”. 2007. On the 1st February 2007 THE RIFLES were formed from a union of The Devonshire & Dorset Light Infantry, The Royal Gloucestershire, Berkshire & Wiltshire Light Infantry, The Light Infantry and The Royal Green Jackets. The Royal Rifle Volunteers became the: 7th BATTALION, THE RIFLES.